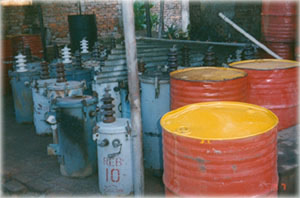 Millions of PCB transformers were manufactured between the 1930s and the 1970s. Photo courtesy of sos-arsenic.net. IN THOSE frightening days shortly after the December 1991 PCB disaster at SUNY New Paltz, I was on the staff of The Oracle student newspaper as its statewide affairs editor. Because I was in town for the winter holidays when the PCB explosions occurred, I began covering the incident from the first day, and then school resumed. The Oracle's editor in chief was someone named Bill. He was reluctant to print my articles on the contamination, which was mysterious: the campus was covered with guys in bunny suits and gas masks filling hundreds of waste barrels, and it was a big story that affected all students -- many of whom were living in toxic dorms. In short, the campus was in a state of toxic chaos; people were scared and concerned; and the most important contact point for students -- the campus newspaper -- was sitting paralyzed. As it turned out, he was a devout Roman Catholic and had confided in his friends on the staff that this was a religious issue: he was afraid he would go to hell if he stirred up too much controversy. This seemed strange, but it was verified somewhat when he took his J-school internship at Catholic Daily. I was extremely relieved when he graduated. I continued on my path of exposing PCB fraud, including the dangers on the campus, in local, national and international media. I had some success getting articles into the paper under the new editor. I didn't think about Bill for years, until one day there was a public meeting at the Kingston Holiday Inn called by General Electric, the company that dumped tons of PCBs into the Hudson River. GE's publicists had created a kind of chataqua, traveling up and down the Hudson Valley in an effort to convince locals that dredging PCBs out of the Hudson (as the EPA had ordered them to do) was a bad idea. After the meeting, I saw a little gathering of people in suits, and walked up to them and said hello. They turned out to be a cadre of public relations people from GE and its various subsidiaries, many of whom it turned out collected my articles. And wouldn't you know it -- Bill was among them, in a cute blue business suit looking so very grown up. He sheepishly extended his hand and said hello. I hope I did not roll my eyes, but the look on his face was priceless. Bill had gone to hell after all, and he knew it. Some people who join industry as mouthpieces for polluters (sometimes called nozzleheads) know where their allegiance resides from the beginning. Bill may have been one. Instinctively, he knew at least not to get on the wrong side of the issue; his future was at stake. Yet it's not only people who are enamored of power and money, or of earning a good living however they can, who end up as nozzleheads. Sometimes the most devoted journalists, anti-toxins activists and previously honest scientists turn coat and end up on the other side of the fence, peddling death. Noteworthy but not noteworthy enough among them is Keith Schneider. He wrote some of the most in-depth coverage of a vast, terrifying toxins scandal in the late 1970s and early 1980s, involving fraud by product safety testing laboratories. Keith Schneider, courtesy of MLUI. His series on the Industrial Biotest Labs scandal and the subsequent federal fraud trial of its top executives was published by Amicus Journal, the magazine of the Natural Resources Defense Council (NRDC). His first article in the series, "Faking It," is considered a classic exposé in environmental journalism history . "You can't print that, Keith" she said. "It's not true." Despite Carol's warning, he included the incorrect "information" in his article. This was a bad sign, a portent. Keith was later hired by The New York Times covering environmental issues. On Aug. 15, 1991, he wrote an influential article which said that exposure to dioxin "is now considered by some experts to be no more risky than spending a week sunbathing." This was in explicit contradiction to all the well-known science of the era, which was being collected in a vast reassessment of dioxin's toxicity being conducted by the Environmental Protection Agency. Not long after, he followed up with his notorious front-page series about how dioxin is less toxic than previously believed. The risks had been overstated by science, he said. The articles got worldwide attention, and were re-published by hundreds of newspapers via the New York Times News Service. Editors around the country railed in their editorials about billions in wasted tax dollars spent cleaning up a non-poison. Dioxin up to that point had been characterized as the most lethal chemical known to science, 11,000 times more toxic to guinea pigs than cyanide. It had been detoxified by a few strokes of the pen. The problem was that nothing in Keith Schneider's articles was true. It turned out that Keith and his editor at the Times, with some help from a paper industry flak in the federal government, an assistant surgeon general named C. Vernon Houk, had made up the "facts" in these articles. In fact, what science was determining was, sadly, the opposite of what Schneider was printing: the dioxin levels in the human body were going up, and the dose known to create a toxic response was going down. The whole mess was later exposed in a June 1993 investigative report in American Journalism Review (AJR) by Vicki Monks. Keith quietly disappeared from public view. The Times never retracted the articles, which for a while were accepted as gospel truth. They still remain in the public record, uncontested except for Vicki's report in AJR. Houk himself had recently done some tail-turning in his own career. As an official for the federal Centers for Disease Control in Atlanta, he was one of the people who had supported the buyout of an entire town badly contaminated by dioxin in the early 1970s, Times Beach, MO. More than 2,000 people had been moved out of the town, which was shut down in 1983 at a cost of $30 million to federal taxpayers . According to Monks, "By May 1991, however, Houk apparently had reversed his views about dioxin. He told attendees at a Columbia, Missouri, conference on environmental health that he now believed times Beach should never have been moved. Houk said that new research was showing that dioxin is 'not especially harmful to man'." Once again, the facts and the science were going in the opposite direction. Another not-famous-enough person in this genre is Dr. Renate Kimbrough, who is credited with the discovery that PCBs cause cancer in female mice -- the first study to establish their carcinogenicity. Her landmark 1972 study was published in the Archives of Environmental Health . Kimbrough's name appears on a "holding statement" distributed to the press by General Electric, a company that manufactured PCB equipment for many decades, on Aug. 15, 1991. She is described as a "former EPA official" and "published world expert on PCBs." An article she wrote four years earlier is quoted: "A recent survey of published scientific studies found that the only observed acute effects (of exposure to PCBs) have generally been minor. So far, no significant chronic health effects have been causally associated with exposure to PCBs" . What reporters are not informed of in this holding statement is that Kimbrough was receiving money for her work from General Electric -- along with all the other renowned scientists listed on the holding statement. This was not commonly known, but some scientists following the issue of dioxin fraud were aware of her position. "You should be cautioned regarding any consultation with Dr. Renate Kimbrough at EPA regarding the review of the Monsanto studies," wrote Cate Jenkens, a whistle-blowing scientist for the EPA in a Nov. 15, 1990 memorandum. "Dr. Kimbrough was contacted by Monsanto during the Kenmer v. Monsanto litigation and provided expert testimony, while an employee of the Centers for Disease Control, on behalf of Monsanto. Dr. Kimbrough has provided expert testimony on behalf of other defendant corporations responsible for dioxin pollution even co-authoring papers with these defendants." Kimbrough later did a study funded by General Electric which "proved" that exposure to PCBs reduces your risk of cancer . What she did not say in her study is that if you were heavily exposed and don't get cancer before you die, it's probably because you had a heart attack first. WHEN WORKING with people new to the dioxin and PCB issue, I will often warn them about these turncoats: people who betray the public trust, and ultimately, themselves. When you're doing anti-toxins work, it seems that you have one foot on a banana peel and one foot in the GE public relations department. No matter how enthusiastic or well-intentioned, nearly anyone is susceptible to being converted; or capable of entering a kind of mental limbo and refusing to say what they know. Often, those with the most information are the ones who go silent first. In 2004, the editors of The Oracle student newspaper, who had helped me verify with independent tests that two occupied dormitories were extensively contaminated with PCBs, suddenly decided to break contact with me and never printed the story. They acted as if they had not been there for the sampling process and refused to admit the test results. Their readers never found out, though I covered the issue later that year in Chronogram magazine. This may have had something to do with the fact that several of the editors lived in the contaminated buildings. There are times when denial is the most convenient way to deal with the truth. Why else does this happen? Doing anti-toxins work invariably puts people into contact with government and corporate officials who possess an aura of power and who seem to have a much sweeter deal. These people seem to be the ones holding the cards; they are always "nice guy" types; and unlike most activists, they get paid for what they do. In the case of students doing on-campus anti-toxins work such as at SUNY New Paltz, the administration they are fighting holds direct power over them, in the form of their degree, and in the form of being able to ban them from the campus allegedly for being disruptive (I was arrested once, and banned once; I prevailed in a federal lawsuit and am now allowed on campus unconditionally). SUNY New Paltz in particular has a long history of arresting activists, declaring them "persona non grata," and for engaging in other forms of reprisal. It does not take much to scare a student activist into behaving himself or herself. Even a mere insinuation from an administrator is enough. Not everyone buckles; but it happens often enough that we need to pay attention. The first people to be mindful of are those who don't want to rock the boat. They are involved in a controversial issue, but are scared of the controversy and confrontation involved. In psychological terms, they have not dealt with key parental issues and their parents are still running their lives. People who are not having fun doing activist work are candidates; if it is a chore, or something they do out of guilt, they may be looking for an easy out, and industry has plenty of them. Then we need to beware of those want to cozy up to powerful people; to make friends with them; to make deals with them; and most of all, not to offend them or risk losing their nonexistent "cooperation." Anyone who says, "We have to keep a low key on the issue, so we don't offend people in power and alienate them" is a prime candidate. Beware of anyone who is even remotely charmed by a polluter or their representative; who says what a "nice guy" they are; or who thinks that you can change the mind of someone who knowingly exposes people to poisons. Beware of anyone who acts like a detective and thinks they can negotiate with Charlie Manson. And we need to beware of people who play fast and loose with the truth -- on any subject whatsoever. Beneath the dedication to a clean environment or government accountability must be a commitment to reality. Toxins activists need to be impeccable in their speech and their conduct, on every subject, or make a gosh darned sincere yoga out of trying. If the nature of environmental polluters is to lie, to deceive and to conceal the evidence, those working against them need to possess precisely the opposite attributes: a devotion to the truth; a commitment to exposing and preserving the evidence; and immunity to intimidation, however they manage to pluck up the courage. Finally, we need to remember above all else the people who are being exposed to toxins, and the frame of mind that is leading to that exposure. If the nature of those who poison is to disrespect human life, toxins activists have one responsibility that must inform all the others: to be humanitarian, to be fair, and to take care of people. Schneider, Keith; "Faking It," published by Amicus Journal in the spring 1983 edition. Reprinted by Planet Waves. Monks, Vicki; "See No Evil," published by American Journalism Review in the June 1993 edition. Reprinted by Planet Waves. Deposition of Steve Hamilton, GE's vice president for environment, taken by David McCrea, Esq. The media holding statement and related memo, dated Aug. 15, 1991, is an exhibit to the Hamilton deposition. GE was attempting to do damage control after Business Week published a report titled, "Did Westinghouse Keep Mum on PCBs?" I received the documents from Steve Sandberg, a plaintiff against GE in a toxic exposure lawsuit. Francis, Eric; "GE Discovers the Cure for Cancer," Planet Waves, March 1999, including interview with Kimbrough.